U.S. Navy auxiliary ships are vital to maintaining a strong and efficient naval fleet. They are designed to perform multiple roles to effectively support combatant ships in and out of battle, as well as complete other similar naval operations. Although auxiliaries assist other ships and do not execute primary combatant operations, they are equipped for self-defense action. Auxiliary ships are no longer equipped with the 127-mm guns that they possessed in the late 1930s or the 76-mm guns that were common during World War II for self-defense. Today, most active Navy-manned auxiliary ships have a minimal armament of 20-mm Gatling guns for close encounter self-defense. None of the ships operated by the U.S. Navy Military Sealift Command carries guns on board, and the Fast Combat Support Ship (AOE) is the only Navy auxiliary classification armed with guided missiles. Unlike most Navy vessels, there are multitudes of auxiliary ship designations with many different designs and primary functions. Oilers and tenders replenish other ships with fuel, ammunition, supplies and food. Tankers transport fuel to other locations, while other auxiliaries transport other ships and Navy personnel. Salvage ships rescue and tow damaged ships hurt during battle. Repair vessels serve as on-the-sea hubs for ship repairs. Tugboats and other ships provide harbor support, and some ships produce research of the Navy’s operating environment and test future technology advances. Throughout the years, the Navy has developed numerous modified auxiliary designations, including oilers, tenders, tankers, salvage ships and tugboats, among others. Our Veterans Department can help you or a loved one file asbestos-related VA Claims and secure other benefits. Although there are at least 50 different auxiliary designations and the total number of Navy auxiliary ships ever built exceeds 2,000, not many remain active today. Among those still in service are USS Emory S Land (AS 39), USS Frank Cable (AS 40), USS Mercer (APL 39), USS Pueblo (AGER 2), USS Neodesha (IX 540), 14 advanced auxiliary dry cargo ships (AKE), 13 other Unclassified Ships (IX) and 16 other Non-self-propelled Barracks Ships (APL). Like all other U.S. Navy ships active from the early 20th century through the post-Vietnam era, the U.S. fleet of auxiliary ships was contaminated with asbestos, a fibrous mineral known for its insulation properties. The U.S. military began implementing a number of asbestos-containing products into the construction and operations of its ships from the 1930s through the 1970s. The mineral’s resistance to heat and electrical damage, versatility and affordability contributed to its popularity in naval shipbuilding, before its hazardous health effects were widely known. 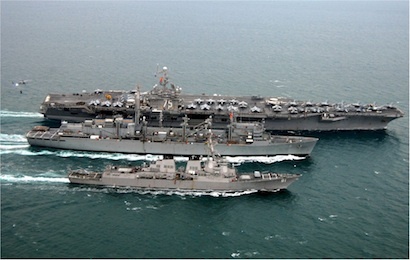 USNS Arctic (AOE 8), center, replenishes USS Harry S. Truman (CVN 75) and USS Winston S. Churchill (DDG 81) while underway in the Persian Gulf, 23 January 2008. When asbestos fibers become airborne through repeated use and daily wear and tear, some fibers may become lodged in the lining of the lungs, abdomen or heart. Prolonged accumulation of these fibers may lead to tumor growth and the development of mesothelioma cancer or other asbestos-related illnesses. Bulkheads, insulation, cloth, pipes, boilers, gaskets and fire-resistant sheets were some of the most common asbestos-containing parts on board Navy auxiliary ships. Ship decks, ready service rooms and any part of the ship exposed to weather often contained asbestos insulation and other asbestos-containing products. The government implemented safety standards in 1943 to help protect naval personnel and those who built or repaired naval vessels. However, these standards were routinely ignored, jeopardizing the health of Navy veterans through exposure to the hundreds of asbestos-laden materials on board U.S. Navy ships, including auxiliaries. Archived documents including purchase orders, repair logs, letters and memos confirm the pervasive use of asbestos-containing products aboard U.S. Navy auxiliary ships. USS Arcadia (AD 23) at sea, circa 1965. A document pertaining to USS General G.O. Squier (AP 130) and all AP class ships from the 1940s states that all ships belonging to the AP class were built with asbestos gaskets. Archived memos from USS Arcadia (AD 23) during the years 1944-1945, 1959-1961 and 1965-1966 state that the ship contained Johns Manville and Eagle Picher brand asbestos insulation and lagging for machinery, piping and other equipment, and asbestos cement for insulation in its main steam piping. U.S. Navy Bureau of Ships (BuShips) and Board of Inspection and Survey records, including construction records, correspondence and inspection reports, confirm the use of asbestos aboard USS Myrmidon (ARL 16) including sprayed asbestos insulation for all decks, bulkheads, beams, girders, magazines, ready service rooms, spaces exposed to weather, refrigeration spaces and navigation bridge. A document detailing repairs for USS Vulcan (AR 5) states that all ships with the AR designation contained Unibestos asbestos blocks manufactured by Union Asbestos and Rubber Co.
An e-consultation can get you an opinion from a top mesothelioma specialist without having to travel. Among those with the highest risk of asbestos exposure are those responsible for constructing and repairing Navy auxiliary ships. Shipyard workers perform various roles during their career, including electrical work, insulating, general contracting, painting, plumbing, repairing and welding. Nearly every major shipyard in the United States was involved in the building of ships for the Navy during the World War II era. By 1944, nearly 2 million U.S. workers were employed in shipyards. While only 1 in 5 shipyard workers of the period were categorized as direct asbestos workers, like those who installed insulation and fitted bulkheads during construction or repairs, the majority of the workers at these shipyards were exposed to asbestos dust and asbestos materials through their work. From the 1930s through the 1970s, asbestos was a vital component in the shipbuilding industry, and construction plans required the presence of asbestos from engine and boiler rooms to sleeping quarters and mess halls. The extensive exposure put shipyard workers at the highest risk for developing asbestos-related illnesses. Other workers with more specialized jobs such as boilermen, enginemen, firefighters, machinist mates, shipfitters and pipefitters, electrician’s mates, Seabees (military construction) and other Navy personnel were also exposed to dangerously high levels of asbestos throughout the course of their service. Crew members on auxiliary ships often performed routine maintenance on asbestos-containing parts and were exposed to the toxic mineral. If crew members were stationed on board for long periods of time, they may have been exposed to parts that had been worn or broken down from daily wear and tear. Family members or close friends of shipyard workers or Navy crew members may also be at risk for developing an asbestos-related illness through secondary exposure, or indirect exposure, which can be just as dangerous. During the 20th century, when asbestos was widely used but its dangers were not widely known yet, men made up the majority of the industrial work force. They were employed in occupations that extensively used asbestos products and they would often bring home loose asbestos fibers on their clothes, skin and hair, exposing their families. Exposure aboard auxiliary ships continued long after World War II and into the Korean and Vietnam wars. Sailors, workers and their families were exposed to asbestos well into the 1970s. Auxiliary ships have been a vital part of the U.S. Navy since the late 1800s. The introduction of destroyer tenders (AD) in the 1890s provided complete support to destroyers and all other surface ships. Although the number of active auxiliary ships has fluctuated between wartimes — peaking during the World War II era, and falling to approximately 50 active auxiliary ships today out of 2,000 total U.S. auxiliaries ever commissioned — their role has not diminished in importance. World War I Acquired Vessels (ID) dominated the U.S. Navy auxiliary ship fleet during the First World War. Most of these ships were built as privately owned pleasure craft, but with the United States’ involvement in the war quickly approaching, the Navy needed to build its fleet as quickly as possible. The ships were modified for naval use and soon after commissioned into the U.S. Navy. 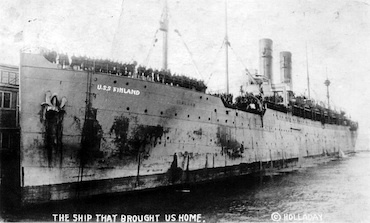 USS Finland (ID 4543) arrives at Newport News, Va., with returning U.S. troops in 1919. The primary goals for World War I Acquired Vessels were to provide support for larger ships by transporting crew members or supplies from land to sea, and provide harbor support, including transporting ships and equipment around the port facilities and service ships currently in the harbor. USS Orizaba (ID 1536) carried more than 15,000 troops in six convoy trips to France before the end of the war, and USS Covington (ID 1409) served as a transport for the U.S. Navy during this time. The transport was struck by an enemy ship on July 1, 1918, and was scuttled the next day with six men killed. 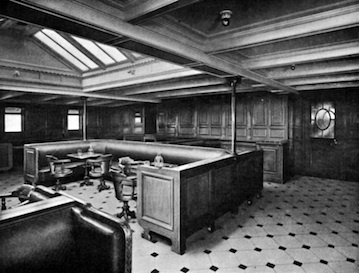 The second-class smoking room aboard USS Finland (ID 4543). As the war concluded, most of these civilian ships were decommissioned, and the U.S. began to build its own fleet of auxiliary ships. This included an expansion on what was seen as one of the most significant types of ships during World War I — ones that primarily transported soldiers from land to sea, as well as fuel and other essential supplies. This type of ship became known as a transport ship (AP), and its involvement in the Navy fully commenced with USS Henderson (AP 1), commissioned in 1917. The Navy’s transport force was vastly expanded at the end of the World War I. By 1918, the Navy successfully built five transport ships, and after the conclusion of the war, these vessels became the priority among newly built auxiliary ships. Construction of approximately 60 more transports was completed or almost completed during peacetime. As the interwar period began, the United States seized many German ships and converted them into cargo ships (AK). By the time the United States entered World War II, additional cargo ships were built to provide valuable logistical support that many say helped win the war. Starting in 1918, the U.S. Navy began construction of a number of different auxiliary ship designations, including arguably one of the most important classes of this time, the ammunition ships (AE) class, which replenished other naval vessels with ammunition, explosives and supplies. These vessels were high-capability underway replenishment ships, fitted with the Fast Automatic Shuttle Transfer system for the rapid transfer of ammunition. Repair ships (AR) also began their service during this time period, in an attempt to build a strong and efficient support team of auxiliary ships by repairing hulls, buckled decks and twisted bulkheads of every type of U.S. Navy vessel in battle. After completion, the Navy upgraded the first few repair ships from oil-powered ships to coal-powered ships. With the threat of the Unites States’ involvement in the World War II, the Navy focused on constructing new ships, as well as modernizing past naval auxiliaries, to prepare for its impending combatant fleet expansion. Construction of repair ships continued throughout the war to ensure Navy vessels remained at peak strength and operated with flawless efficiency. The Navy also started construction of landing craft repair ships (ARL) at this time. The majority of transport ships and 0iler, or fuel oil tankers (AO), were fully commissioned during the Second World War. 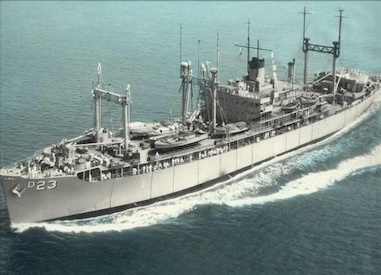 0iler, or fuel oil tankers, were midsized combat logistics ships designed to carry 180,000 barrels of petroleum. They were the primary source for fuel replenishment during the Second World War. In 1944, the Navy had an urgent need for self-propelled special barracks and stores ships (AF). In response to this request, World War II era store ships reached its 47th ship and last ship of that era with the AF designation, USS Valentine (AF 47). She and her sister ship, USS Vega (AF 59), were the Navy’s largest reefers and were built to a modified merchant ship design. The Korean War required yet another rapid, but smaller expansion of the auxiliary fleet, because supplies were largely inadequate as the United States attempted to slow advances of the North Korean Communists. In response to the lack of supplies and the need for sheer force, many ships, including USS Mount Baker (AE 4), were recommissioned for service. USS Mount Baker was responsible for replenishing the United States and other U.N. forces fighting against North Korea with ammunition and other necessary supplies during battle. 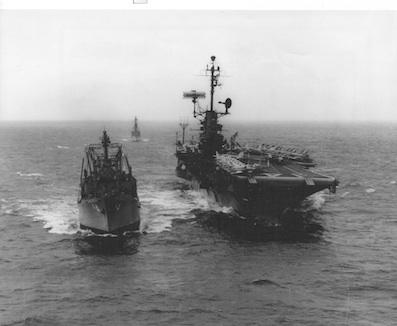 USS Mount Baker (AE 4) and USS Ticonderoga (CVA 14) while conducting a transfer between ships during the Korean War, circa 1951-52. Ammunition ships played a vital role through the Vietnam War. USS Rainer (AE 5) reached her first underway record for transporting 826 tons of ammunition and supplies to USS Camden (AEO 2) in five hours, and USS Mount Baker (AE 4) spent her last years replenishing the 7th fleet ships operating off the coast of Vietnam. The once-imperative transport force was replaced during the Vietnam War with long-range jet-propelled passenger aircraft, which were more affordable and provided a more convenient way of moving soldiers and Navy personnel long distances. Toward the end of the war, the U.S. Navy auxiliary ship roster diminished. Today, the tender classification, repair ships and many others have been completely eliminated from the naval force. 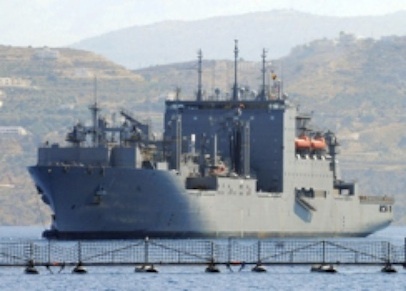 USNS Lewis and Clark (AKE 1) arrives in port, 2011. However, in 2006, the U.S. Navy launched a new breed of auxiliary ships: the Dry Cargo and Ammunition Ship (AKE). These vessels are operated by the Navy’s Military Sealift Command and provide multi-product combat logistics support to the Navy fleet. The classification – including its first ship, USNS Lewis and Clark (AKE 1) — replaced the Kilauea class of ammunition ships (AE) and the Mars class of combat store ships (AFS), with the objective of replenishing other ships to ensure a more effective battle fleet at the lowest life cycle cost. The new AKE classification includes 14 ships that were completed by the fourth quarter of 2012 with a budget of more than $6 billion.